The last time I made this summery roast, I also made a big pile of flat breads. They were so good, being a little blistered, crisp and soft all at the same the time. We piled the cumin-spiked beetroot onto the flat breads and then lifted the tender fillets from the grilled sardines and laid them over the top. We spooned over the cool minted yoghurt and rolled it all up into the most ridiculously good sardine-and-beetroot wraps. It was a top way to eat this full-flavoured yet underrated oily fish – but it’s just as good more conventionally, alongside a good, simply dressed green salad. Heat the oven to 200°C/400°F/gas mark 6. Place the beetroots in a large pan and cover with water. Place the pan over a high heat, bring the water up to a simmer and cook the beetroots, uncovered, for 20–25 minutes, until they yield to the point of a knife. When the beetroots are ready, drain them and leave them to cool in the colander. When they’re cool enough to handle, slip off the skins and place the beetroots in a roasting tray. If they’re big, halve or quarter them so that all the beetroot pieces are roughly the same size. Drizzle over 2 tablespoons of the olive oil, scatter over the rosemary sprigs and season with salt and pepper. Place the roasting tray in the oven and cook the beetroot pieces for 20–30 minutes, until golden and blistered in places. 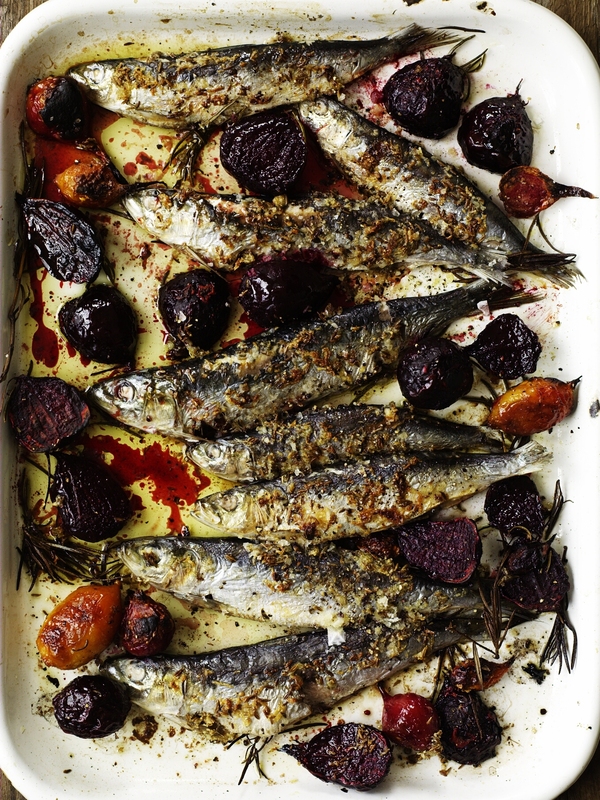 Remove the tray from the oven and lay the sardines among the beetroot. Turn off the oven and heat the grill to high. is starting to crisp. Meanwhile, in a small bowl mix the mint into the natural yoghurt, stirring to combine thoroughly. When the sardines are ready, bring the roasting tray to the table and serve everything with the minty yoghurt alongside.